Always at the behest of the weather and fixture scheduling; groundhopping is unsurprisingly littered with random stumbling blocks. This season however, tracking down my sporting heroes has become an added obstacle to navigate. During this run-in, I spent hours rereading past interviews. I heard he’d turned to a life away from football but just as in the 80s, Wilf Rostron was utterly impossible to leave out. Back in the summer, Graham Taylor’s dissection of that masterstroke – where an uncertain looking winger became both, one of the finest defenders in the club’s history and his perfect captain – was mesmerising. Over the following months, more research was completed and favours called in but leaving for the North East, I still had no idea of Wilf’s whereabouts. We all choose paths in life; who am I to judge any others’ but, driving past the Angel of the North – from black to red sides of this region – I could hardly have been prepared for the next few hours. As I was about to enter Ryhope, the jolt of a pot hole removed the satnav from the hire car windscreen. I’d already seen floodlights so – paying it no heed – I honed in on their general direction. Past architectural monuments to the town’s once great industrial heritage I travelled, distracted by both the nearing North Sea and the stadium that was my goal, through massive new residential estates with some helpful local guidance. Then hidden in the bushes, I spotted it… “RCA FC” the sign read. 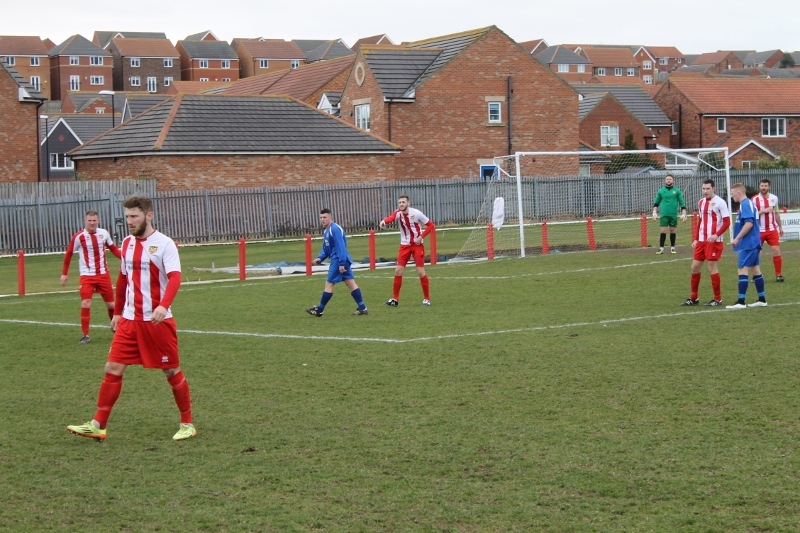 With some notable successes, traditionally the Welfare have contested life in the Wearside League. Back in December 1967 however, they reached the FA Cup 1st Round Proper. 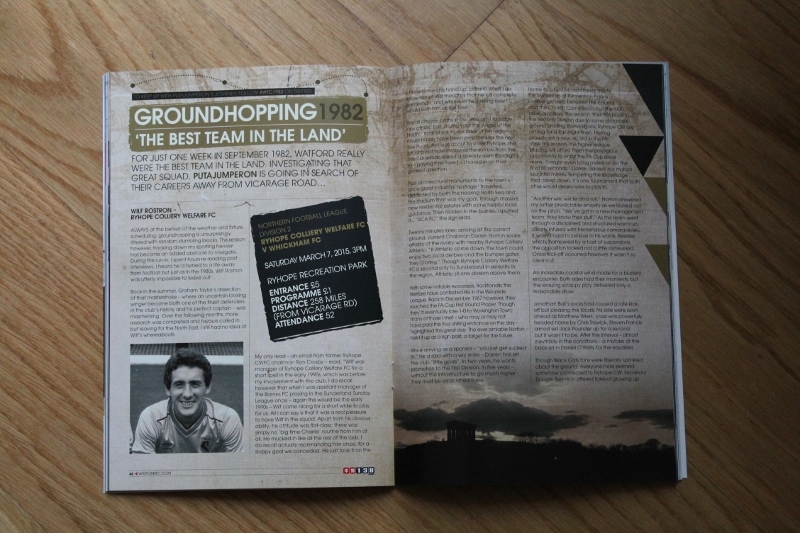 Though they’d eventually lose 1-0 to Workington Town; many of those I met – who may or may not have paid the 4 shilling entrance on the day – highlighted this great day. The ever amiable Norton held it up as a sign post; a target for the future. 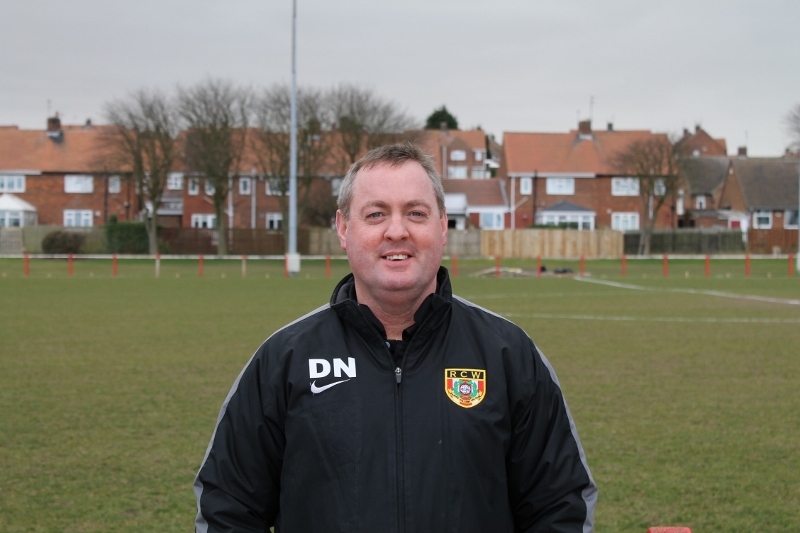 Since arriving as a sponsor – “you just get sucked in” he’d said with a wry smile – Darren has set the club “little goals”. In two years, he wants promotion to the 1st Division; in five years – without the infrastructure to go much higher – they must be established there. Home to a host of community sports, the ownership of Recreation Park is confusingly held between the council and the Church Commission but the club have ambition. 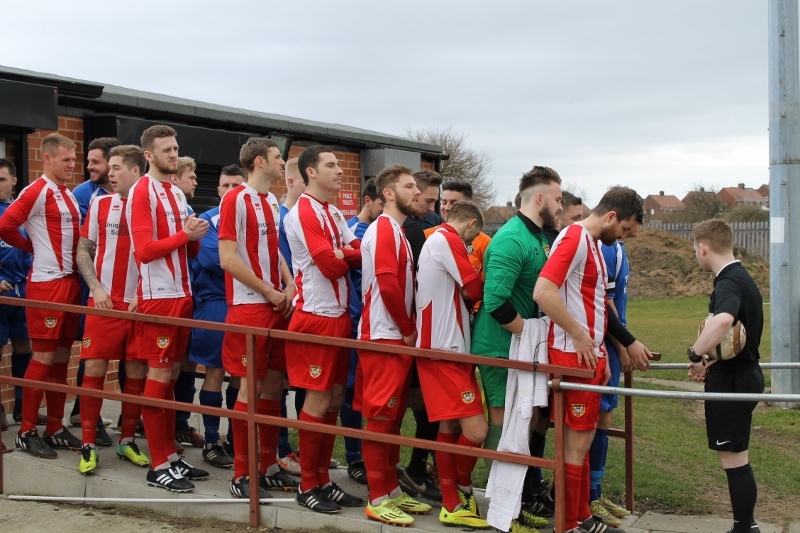 This season, their first back in the 2nd Division due to some dictatorial ground grading shenanigans, Ryhope CW are aiming for a top eight finish. 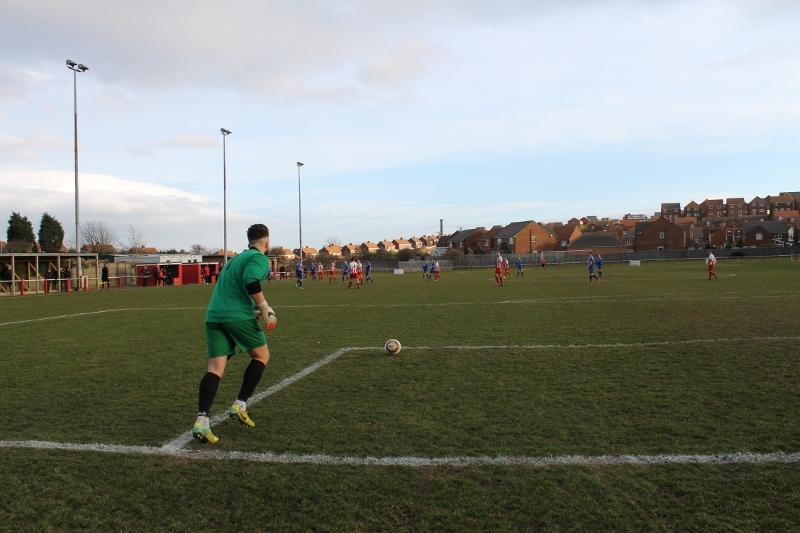 Having proudly set a new record in the FA Vase this season, this higher league placing will afford them the prestigious opportunity to enter the FA Cup once more. “I might even bring myself on for the final sixty seconds” Darren added; our mutual laughter merely tempering the knowledge that, deep down, it’s one tournament that both of us would dearly love to play in. As the team went through a disciplined and structured warm up, clearly infused with tremendous camaraderie, it wasn’t hard to believe in his words. Besides which, hampered by a host of suspensions, the opposition looked not a little dishevelled. Once kick off occurred however, it wasn’t so clear cut. An incredible coastal wind made for a blustery encounter. Both sides had their moments but, the ensuing scrappy play delivered only a reasonable draw. 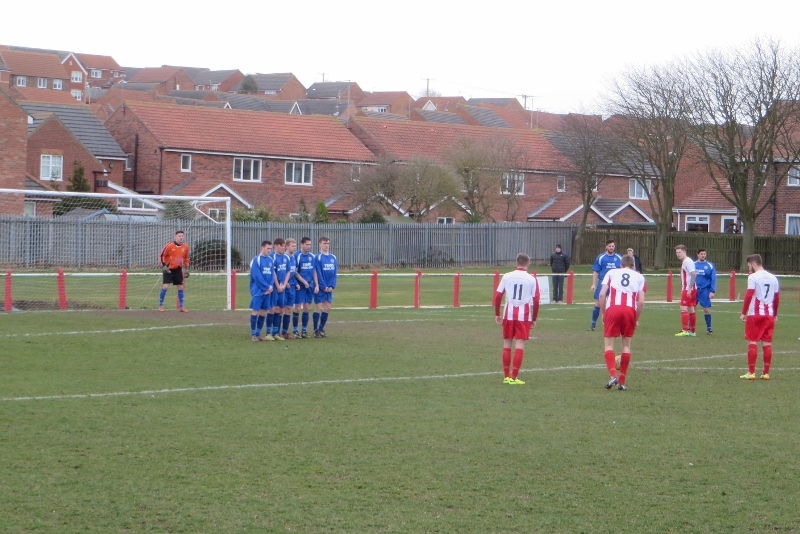 Jonathan Ball’s socks had caused a late kick-ok but pleasing the locals, his side were soon ahead as Matthew Wiers’ cross was powerfully headed home by Chris Trewick. Steven Francis almost set Jack Pounder up for a second but it wasn’t to be. After the interval – almost inevitably in the conditions – a mistake at the back let in Daniel O’Reilly for the equaliser. 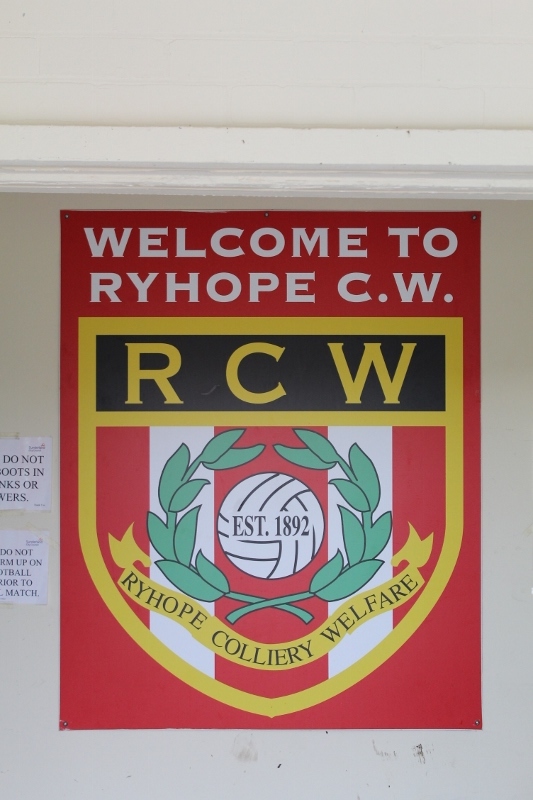 Though Black Cats fans were liberally sprinkled about the ground, everyone here seemed somehow connected to Ryhope CW. Secretary Dougie Bennison offered tales of growing up on the estate next door and, of his son gracing the team. He also explained how the pit head once proudly stood just under a mile north of Recreation Park. Fan of both Sunderland and Ryhope, Peter Reid, had no end of entertaining anecdotes of Rostron, Micky Henderson and Colin West, and once spending a week in his Plymouth military base with Graham Taylor’s pre-season Hornets tour, where Tommy Mooney was surprised to find Reid saluting a brick wall during reveille. Whilst his son Philip was captaining today, behind the bar, Dave Hall recounted stories of nights out with his brother-in-law Mick Harford and Tony Coton, before amusingly letting slip how Wilf had put paid to all his own footballing aspirations. 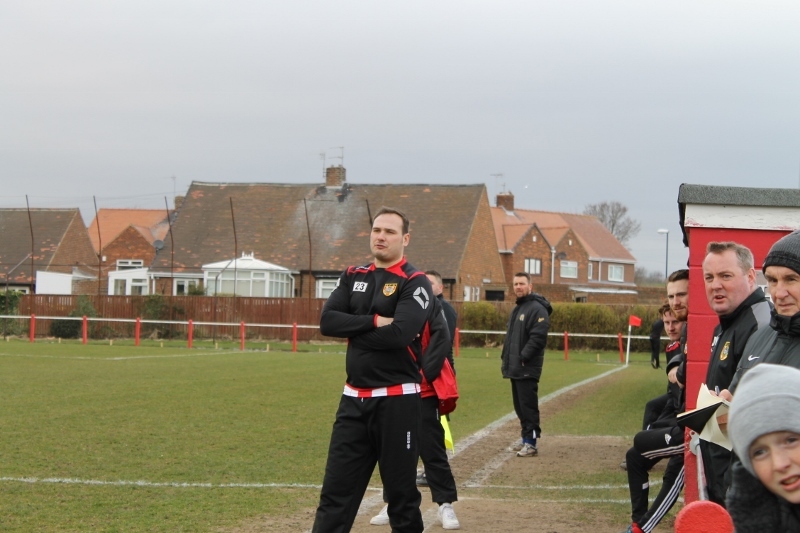 Then Sunderland Youth coach, Peter Jacques, believed in his sides playing up. In one such match Sunderland U11s were facing Hall’s Thornhill U12s. “Wilfy knocked the ball passed me and was off like a whippet. I had no chance.” The younger Sunderland team went on to win 4-0. Even Jordan Brown – 1st Year undergraduate in Sport Journalism – had returned to his family roots. A Lincoln City die-hard where his father Grant is currently assistant manager, Jordan is now learning his trade, reporting on the team his dad once represented. Though I’d not yet found Wilf, with the entertaining welcome by locals – only too willing to aid my quest – the afternoon flew by. 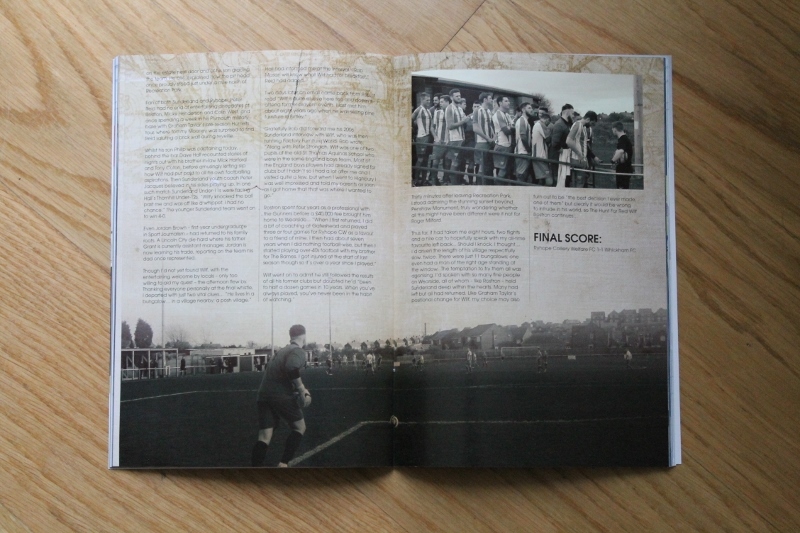 Thanking everyone personally at the final whistle, I departed with just two vital clues… “He lives in a bungalow… in a village nearby; a posh village.” Hall had informed me at the interval. “Rob Mason will know what Wilf had for breakfast.” Reid had added. Gratefully Rob did forward me his 2006 Sunderland interview with Wilf who was then running Factory Furniture World. Rob wrote “Along with Peter Stronach, Wilf was one of two pupils of the old St. Thomas Aquinas School who were in the same England boys team. ‘Most of the England boys players had already signed for clubs but I hadn’t so I had a lot after me and I visited quite a few but when I went to Highbury I was well impressed and told my parents as soon as I got home that that was where I wanted to go’. Wilf went on to admit he still followed the results of all his former clubs but doubted he’d ‘been to half a dozen games in ten years. When you’ve always played, you’ve never been in the habit of watching’. 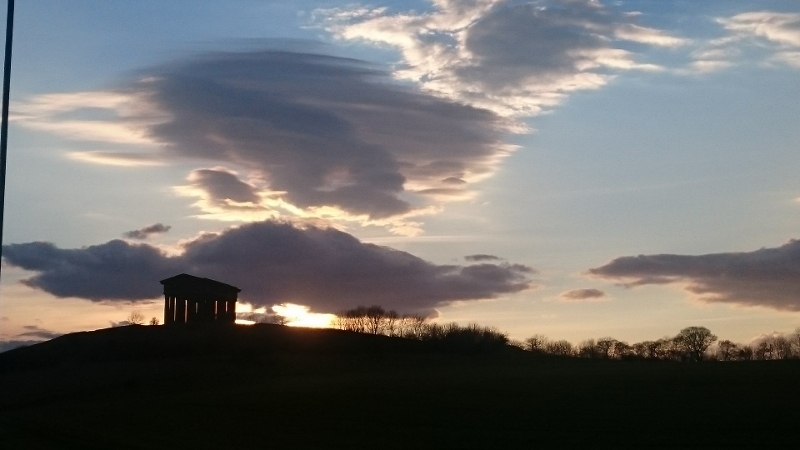 Thirty minutes after leaving Recreation Park, I stood admiring the stunning sunset beyond Penshaw Monument, truly wondering whether all this might have been different were it not for Roger Milford. Thus far, it had taken me eight hours, two flights and a hire car to hopefully speak with my all-time favourite left back… Should I knock, I thought… I’d driven the length of his village respectfully slow, twice. There were just eleven bungalows; one even had a man of the right age standing at the window. The temptation to try them all was agonising. This entry was posted in #WFC1982, 2014-2015, Northern Football League and tagged #WFC1982, FA Cup, Penshaw Monument, RCWFC, Recreation Park, Ron Crosby, Ryhope, Ryhope Colliery Athletic, Ryhope Colliery Welfare, Ryhope Colliery Welfare FC, Sunderland AFC, Watford FC, Wearside, Whickham FC, Wilf Rostron. Bookmark the permalink. I remember Wilf when he lived in Winchmore Hill in digs with Liam Brady, I often had a drink with him in the Queens Head, seems like a lifetime ago.